VICTORIA – The provincial government is seeking public feedback on new livestock watering regulations. An intentions paper released in January focuses on cattle, which represent 96% of livestock grazing 21 million hectares of Crown rangeland and 5 million hectares of private rangeland across the province. 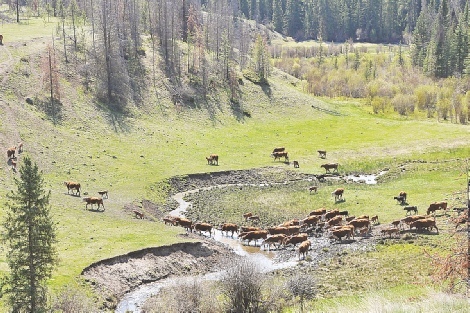 Rangeland grazing is the backbone of the BC cattle industry, but cattle need water. 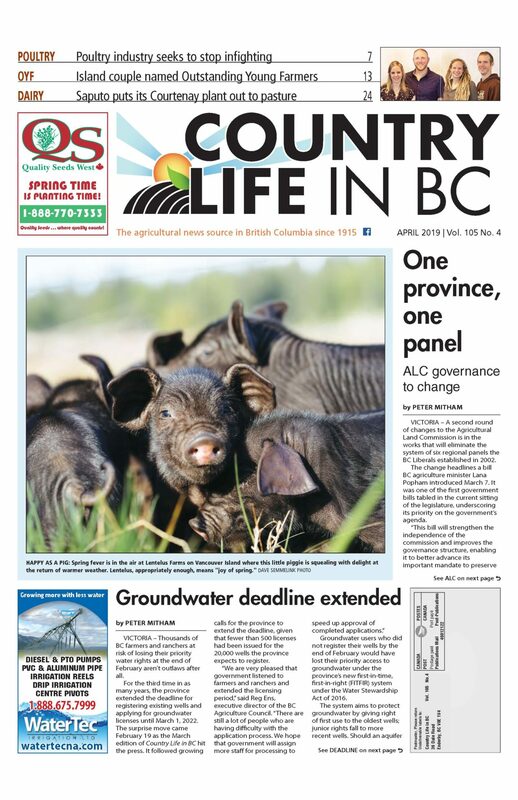 “That grass is of no use to us if the cattle can’t drink water at the same time,” says Kevin Boon, general manager of the BC Cattlemen’s Association (BCCA). We’re not talking about a lot of water. A cow-calf pair on rangeland in the Southern Interior needs about 45 litres a day, less than your morning shower. This amounts to about 1% of the average summer precipitation in the Interior, the province says. The report of the BC ranching task force identified livestock water use as the highest priority for regulatory improvement in 2009. The new regulations were drafted under the authority of the 2016 Water Sustainability Act following more than two years of discussion with industry. Ranchers still retain the right to access water on the range but proposed regulations make it much easier to manage that access. Easier management, in turn, improves the ability of ranchers to protect water quality. These regulations are specifically for rangeland watering, described as “low livestock density” and do not apply to livestock watering in high-density areas, such as feedlots or corrals. Cattle will still be allowed to drink water directly from a stream that is not designated for protection. However, ranchers will be able to manage access to reduce the impact cattle might have. One option is a nose hole, which gives cattle limited access to a fenced-off water source. Diverting water though a pipe into an off-stream watering trough keeps cattle away from the stream, and a float control regulates the water running through the system. Under the proposed regulations, nose holes, off-stream watering systems and minor temporary diversions such as a sling pump could be constructed without notifying a habitat officer but will still be subject to the standards and regulations of the Forest Practices Act and the Range Act. Dugouts provide an important source of water storage for ranchers. They may provide access to shallow groundwater or collect and store ephemeral water or surface water runoff for later use. Dugouts are specifically addressed in the proposed regulations. Authorization will not be required for an existing dugout used exclusively for watering livestock if it was built before the proposed regulations take effect, if it is smaller than 2,500 cubic metres, it does not have a dam or berm more than two metres high nor one regulated under Part 2 of the dam safety regulations. The proposed regulations also don’t require authorization for new dugouts used exclusively for watering livestock if they’re not on a perennial stream or on an ephemeral stream tributary to a perennial stream. BCCA is comfortable with the intentions paper and the public consultation process, which ends February 16.